The President, Shri Pranab Mukherjee releasing a Postage Stamp commemorating the 200 years of the Orthodox Theological Seminary or Old Seminary, Kottayam, Kerala, in Rashtrapati Bhavan, New Delhi on April 21, 2015. The Union Minister for Communications & Information Technology, Shri Ravi Shankar Prasad is also seen. The President of India Shri Pranab Mukherjee released a Postage Stamp commemorating the 200 years of the Orthodox Theological Seminary or Old Seminary, Kottayam, Kerala at Rashtrapati Bhavan today (April 21, 2015). Speaking on the occasion, the President said that for nearly 14 Centuries, the three major religions of Kerala, Hinduism, Christianity and Islam have existed in peace and harmony, respecting each other’s belief and cooperating to promote social welfare. In fact, Kerala was the first state in the country in which both Christianity and Islam took roots with people voluntarily choosing different religious beliefs. The Old Seminary was set up by the Malankara Orthodox Church situated in Kerala, a state known for the peaceful co-existence of different religions and communal harmony. The Seminary and the Orthodox Church played their part in achieving this goal which led to the state realizing the complete separation of spiritualism and communalism. The lighting of oil lamps in and around Churches, the raising of the flagstaff and flags during festivals and the custom of entering the Churches barefoot are all Hindu traditions that have become a part of the Church practice. These bear testimony to the sharing of traditions by both the religions. The President said that the Orthodox Church has made enduring contributions to the betterment of the life of the people of Kerala. The role of the Church in spreading education cannot be ignored. Christian Community established a large chain of elementary Schools throughout Kerala, under the supervision of the Seminary and its leaders. The Seminary was the first indigenous initiative towards universal literacy and education, which has today made Kerala the most literate state in the country. The charity and healthcare activities of the Syrian Church also originated in the Old Seminary under its leadership. It contributed to the improvement of the overall literacy in the state, created greater access to healthcare and empowerment of women leading to higher standards of living and quality of life in the state. The role of the Church in healthcare, women’s empowerment and upliftment of the less privileged section of society are unparalleled. The President said that it is not without reason that the Seminary has to its credit several ‘firsts’ in the area of Human Development, apart from its contributions to the training and development of the clergy of the Church. He said that he was informed that the ‘Cottayam College’, which was co-located with the Seminary was the first English teaching institution in the State. The College taught, apart from Malayalam, Greek, Latin, Syriac, Hebrew and Sanskrit. The first printing press was also established in the premises and scholars of the Seminary took active part in unifying and standardizing the common Malayalam Script. Benjamin Bailey along with Hermann Gundert, were among the pioneers of the development of modern Malayalam language and script. To imagine that the first Malayalam Dictionary was developed and published by a Theological Seminary is a tribute to the commitment of the leaders of the Seminary and the Church itself to the overall development of Kerala. The credit of translating Bible into the first Indian language, Malayalam, also goes to the Seminary and College under the leadership of Benjamin Bayley. The Orthodox Theological Seminary known as Old Seminary or Cottayam Syrian College is run by the Malankara Orthodox Syrian Church, the St. Thomas Christians. This is a heritage monument recognized by the Government for its importance as a two hundred year old quadrangular edifice where English education was started for the first time in Kerala. 1. It gave me great pleasure to release the postal stamp commemorating the 200 years of the “Old Seminary” in Kottayam. The seminary was set up by the Malankara Orthodox Church situated in Kerala, a state known for the peaceful co-existence of different religions and communal harmony. The Seminary and the Orthodox Church too played their part in achieving the laudable goal which led to the state realizing the complete separation of spiritualism and communalism. 2. For nearly 14 Centuries, the three major religions of Kerala, Hinduism, Christianity and Islam have existed in peace and harmony, respecting each other’s belief and cooperating to promote social welfare. In fact, Kerala was the first state in the country in which both Christianity and Islam took roots with people voluntarily choosing different religious beliefs. 3. There is another significant feature of communal relations in Kerala. The absence of animosity between religions is considered tolerance. But this only means the absence of negativity. But in Kerala it has a different dimension. It is that the society has moved to a higher plane where religions have cooperated to promote other religions. It is this extraordinary feature of the society that led to the Hindu Kings of Kerala giving land to both Christians and Muslims to set up their places of worship. In fact, the land for initially setting up the Old Seminary and the first contributions for its development came from the coffers of the Travancore Ruler, Gowry Parvathi Bhai, Regent Queen. 4. 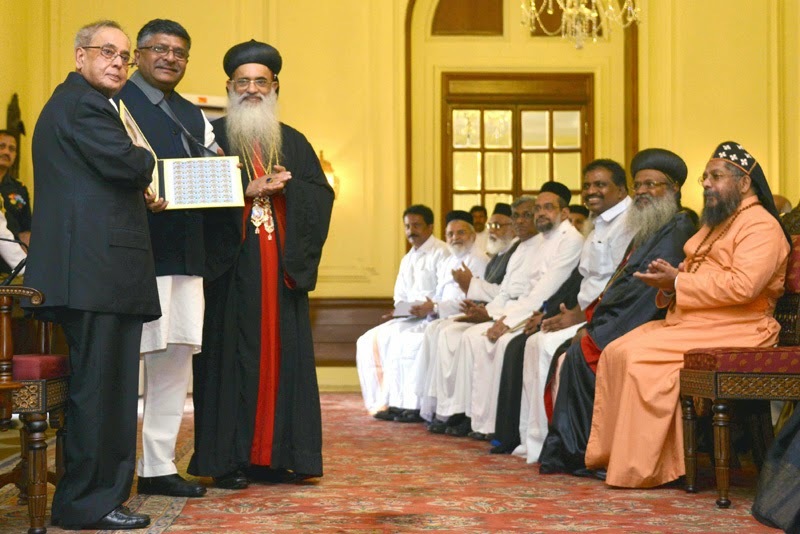 India’s tallest leaders like Dr. S. Radhakrishnan and Pandit Jawaharlal Nehru acknowledged the long and glorious history of the Christian Church in Kerala, and lauded its religious tolerance and respect for other religions. Dr. Radhakrishnan noted that the Syrian Christians have only welcomed those who wanted to join the faith out of their own volition. Pandit Nehru recalled the fact that Christianity in India came in the 1st century itself even before Europe embraced it. 5. It is significant that the St. Thomas or Malankara Christians in their 2000 years of existence has assimilated and in many cases retained some of the important social customs and rituals of the Hindus. An Orthodox Christian marriage ceremony incorporates many such Hindu customs for instance. 6. The lighting of oil lamps in and around Churches, the raising of the flagstaff and flags during festivals and the custom of entering the Churches barefoot are all Hindu traditions that have become a part of the Church practice. These bear testimony to the sharing of traditions by both the religions. 7. I have been given to understand that the Orthodox Church has made enduring contributions to the betterment of the life of the people of Kerala. If Kerala is the shining example of universal literacy, the role of the Church in spreading education cannot be ignored. One of the earliest contributions of the Christian Community is the setting up of a large chain of elementary Schools throughout Kerala, under the supervision of the Seminary and its leaders. 8. The chain of elementary schools set up under the supervision of the Seminary was the first indigenous initiative towards universal literacy and education, which has today made Kerala the most literate state in the country. The charity and healthcare activities of the Syrian Church also originated in the Old Seminary under its leadership. It contributed to the improvement of the overall literacy in the state, created greater access to healthcare and empowerment of women leading to higher standards of living and quality of life in the state. This has resulted in Kerala having the lowest infant mortality, lowest birthrates, highest number of hospital beds per lakh population, best male to female population ratio and one of the highest life expectancy in the country. It is heartening to note that the example set by Christian Churches have been emulated by all religions and Communities. 9. In the area of Human Development Index, Kerala has done remarkably well. The role of the Church in healthcare, Women’s empowerment and upliftment of the less privileged section of society are simply unparalleled. 10. In many ways, the Old Seminary played a seminal role in the unique form of development of Kerala. The Seminary, on its part took upon itself the onerous task of overall development, education and welfare of the whole State instead of limiting its role to the narrow and limited task of teaching religious practices and liturgy to the clergy. 11. It is inspiring to note that the benefits of all these humanitarian and charity work of the Seminary and the enlightened and progressive leadership were not confined to any particular religious group. It has benefitted all in the society, irrespective of religion, caste and creed. This has inspired the other communities to set up similar institutions all over Kerala. 12. It is not without reason that the Seminary has to its credit several ‘firsts’ in the area of Human Development, apart from its contributions to the training and development of the clergy of the Church. I am informed that the ‘Cottayam College’, which was co-located with the Seminary was the first English teaching institution in the State. The College taught, apart from Malayalam, Greek, Latin, Syriac, Hebrew and Sanskrit. 13. The first printing press was also established in the premises and scholars of the Seminary took active part in unifying and standardizing the common Malayalam Script. Benjamin Bailey along with Hermann Gundert, were among the pioneers of the development of modern Malayalam language and script. To imagine that the first Malayalam Dictionary was developed and published by a Theological Seminary is a tribute to the commitment of the leaders of the Seminary and the Church itself to the overall development of Kerala. The credit of translating Bible into the first Indian language, Malayalam, also goes to the Seminary and College under the leadership of Benjamin Bayley. 14. It is interesting to note that the Orthodox Theological Seminary continues the traditions of its predecessor to take active interest in developing nontraditional and liberal disciplines like Counseling, Devotional Music, Meditation and Fine Arts. I hope, in keeping with the great tradition of universal brotherhood, the portals of the Seminary would also accommodate centres for the study of comparative religions and Philosophy. 15. I can say without hesitation that the Orthodox Church and its leaders trained in the great portals of the Old Seminary have not only made sterling contributions to the Human Development of the State but also worked hard to promote shining example of communal harmony and mutual respect among the members of different religions. This is in fact the true accomplishment of the old Hindu concept of “Vasudhaiva Kutumbakam” – “The World is One Family” as envisaged in the ancient Hindu scripture, Mahopanishad. 16. With these few words, I conclude hoping that the Church and the Seminary would continue with their good work for the society. The President of India, Shri Pranab Mukherjee has condoled the passing away of Shri J.B. Patnaik. In his condolence message to his wife, Smt. Jayanti Patnaik, the President has said, “I am sad to learn about the passing away of Shri J.B. Patnaik, a friend and colleague of long years. A veteran Parliamentarian, former Union Minister, Governor, Congress leader and able administrator, Shri Patnaik served the nation in different capacities during his long public life. As Member of Legislative Assembly, Minister and Chief Minister of Odisha, he made immense contribution for the welfare and development of the people and State of Odisha. Shri Patnaik was also known for his varied interests and rich contribution towards literature. In his death, the nation has lost an eminent leader whose service to the nation will be always remembered. The Prime Minister Shri Narendra Modi will address the nation in the next series of ‘Mann Ki Baat’ on 26th April. This is the seventh edition of the radio program in which PM shares his thoughts with the citizens. The Prime Minister has from time to time invited citizens to share their ideas and thoughts on the subject in the Open Forum of MyGov.in. The program has generated an encouraging response from citizens across the country. It is simultaneously broadcast live on all channels of All India Radio and Doordarshan. The program would also be live-streamed on the Prime Minister's official website. The Prime Minister, Shri Narendra Modi, today urged civil servants to maintain a positive outlook, convert adversity into opportunity, and strive towards perfection. Addressing civil servants on Civil Services Day, the Prime Minister recalled Sardar Patel's vision of the Civil Services of independent India, and the role of the Civil Services in national integration. The Prime Minister said today socio-economic integration should also be an objective of the Civil Services. He said national unity today implied an end to the digital divide, urban-rural divide, and all forms of socio-economic inequity. He said the entire administrative machinery today should be geared up to serve the needs of society. "Sheelam Param Bhushanam", (character is the highest virtue) the Prime Minister reminded the civil servants, urging them to maintain a positive outlook, and spend quality time with their family as well. "Your life should not become a file," the Prime Minister said. On the subject of good governance, the Prime Minister said it requires the ART of Accountability, Responsibility and Transparency. He said that as the Indian economy moves from "scarcity" to "plenty," the Civil Services required capacity-building to be able to better serve people. The Prime Minister urged senior Civil Servants to spend time in motivating youth to aspire for, and join the Civil Services, to ensure that the best talent was available to the Government. He referred to a Goldman-Sachs report which said it will take India a decade to reach the Asian average on government effectiveness. He said that while political interference was undesirable, political intervention was necessary to ensure people-friendly governance in a democracy. He urged civil servants to end the "silo-approach" and work as a team. The Prime Minister said that teams of officers from various states should take up as case-studies, the award winning projects, and ensure that these are adopted as best practices, wherever possible. He called upon all civil services to develop an institutional memory. The Prime Minister conferred the 'Awards for Excellence in Public Administration’ for the years 2012–13 and 2013-14 to outstanding initiatives in Public Administration. A book on ‘Best Practices – Tomorrow is Here’ was also released by the Prime Minister.